I happened upon the idea for this piece in an unlikely place- the restroom of a retirement home! Unfortunately, the artwork on the walls didn’t have any artist name anywhere on the pieces of art. 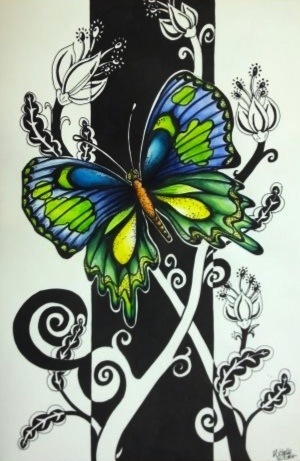 The basic idea was a pen & ink drawing of a bird or butterfly colored with vibrant watercolors & a black & white graphic style background. There were four prints & they were so eye catching that I was inspired to create my own! This could be a project for 6-12th grade and it is a fun exploration of positive and negative space reversal! In pencil, draw a butterfly, bird or insect. Outline your lines with Sharpie-vary the width to add interest. You can also stipple some of it to add texture. If you choose to use ink instead of sharpie, then you should paint it first, then apply the ink. If using sharpie, now paint the image with watercolors. Next, use a ruler to draw a rectangle behind the image. It needs to go from top to bottom. Draw in any additional visual elements (like flowers, swirl ides, etc.). You can have them go in & out of the rectangle area for more interest. Use a sharpie or Pen & ink to fill in the background. I think this one looks like it could be used for a lesson on shape and/or color. I may use this to take the classic Notan expanding the square assignment and add a color focal point. Right now I am gearing up for a summer session with some neighborhood kids (7-12) and I have been subbing at a high school. I will make a handout and reference this as the source.